Endodontics is a field of dentistry that focuses on problems concerning the inside of the teeth. To get a clearer view of what endodontic treatments entail, it’s crucial that you get an overview of the tooth. On the outside of the tooth, you have the white enamel along with a hard layer called the dentin. Beneath these layers you have the pulp, which is the soft tissue that also contains the blood vessels, nerves, and other connective tissue. The pulp extends from the crown of the tooth right to the very tips of the root. At that point, it connects to the various tissues around the root. The pulp is crucial during the growth and development of the tooth as it helps to nourish the tooth. But once the tooth is fully developed it can survive without the pulp. The tooth can be nourished without the pulp because of the tissues around it. When the pulp becomes infected or inflamed, endodontic treatment may be needed. This infection may be due to tooth decay, a chip in the tooth that lets bacteria in, or damage due to repeated dental procedures on the tooth. In some cases, a hard blow to the tooth can damage the pulp even when there are no visible chips in the tooth. You may have an infected pulp if you feel pain in your teeth or extended periods of sensitivity to hot or cold food. Your tooth may also discolor, while the gums near the tooth may swell and become tender. It’s even possible for pulp damage to occur and yet you don’t feel any of the symptoms. To treat the infected pulp, your endodontist can remove the inflamed pulp from your teeth. The area is then carefully cleaned and then shaped before it is filled. It’s then sealed and covered with a crown to prevent the bacteria from coming back into the inside of your tooth. Afterwards, your tooth should function normally again. During the treatment, you won’t experience any pain while the pulp is removed. Afterwards, your tooth may feel a bit sensitive for a few days, and this is more likely if you have already felt pain or tooth sensitivity before treatment. In general, most endodontic treatments are successful and your tooth’s normal function will return. 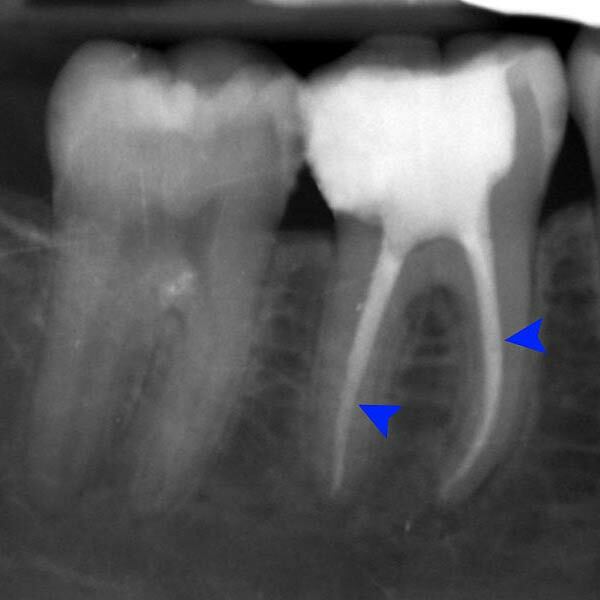 But it’s also possible for the infection to return, which may require another endodontic treatment.